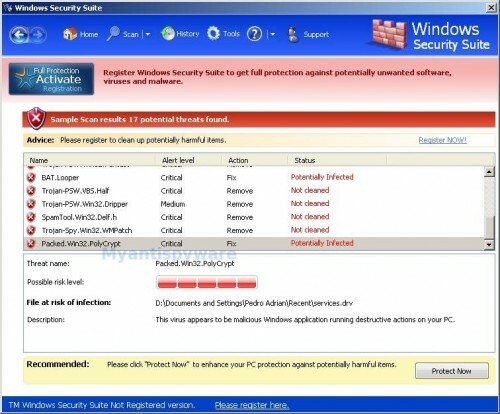 Windows Security Suite is a rogue antispyware program from Virus Doctor rogue family (Malware Destructor 2009, Fast Antivirus 2009 … ). Like other fake antispyware software, it`s distributed through the use of malware and does not offer any protection to computer. Windows Security Suite uses fake alerts and false positives to trick you into buying the program. Once Windows Security Suite is installed, it configures itself to run automatically every time, when you start your computer. In addition the program drops a few files. These files are actually harmless, but during the scan will determine as threats (spyware, malware and trojans). Once running, Windows Security Suite starts scanning the computer and list previously created files as threats to trick you to buy the software, in order to remove these reported infections. You can safely ignore them. remove these potentially harmful items using Windows Security Suite. Windows Security Suite can be safely removed from your computer along with any other malware if the proper steps are taken. If you are a non-techie computer user then this method of removing the rogue is for you. Download OTM by OldTimer from here. Click the red Moveit! button. When the tool is finished, you may be prompted to Restart. Select Perform Quick Scan, then click Scan, it will start scanning your computer for Windows Security Suite infection. This procedure can take some time, so please be patient. Make sure that everything is checked, and click Remove Selected for start Windows Security Suite removal process. When disinfection is completed, a log will open in Notepad and you may be prompted to Restart. I don’t know how I got it but knew it was a rogue virus and never accepted any of the bogus prompts that came on. I want to thank you, Patrik. I finally got rid of all that nonsense. My anti virus cannot remove spyware. I’m lucky I read this information. I hope this would help a lot. Hey guys, I’ve tried Malware and the OTM and when I run HiJack This, it still says that I still have Hijacked hosts. When I run all the scans from SuperAntiSpyware to MalwareBytes, it doesn’t find anything. I’ve been trying to figure this out for a month now and nothing seems to work. Any help and info would be truly appreciated. Let me know what info you need me to provide. Thank you. OHMYDAYS! I have been trying all day to get this to work! Saved my lifee! I thought my dad would find out i had practacly broken my laptop and would kill me! Thanks soooooo much! Was I supposed to download the OTM on the account that has the virus because on that account I can’t go on the internet. Jessica, try download the suggested programs above in Safe mode with networking. Thanks the virus is official deleted from my computer, but my internet is not working. Thank you so much. The virus is official gone from my computer. I am so happy!!! I have the same issue as Jessica, although I cant get on the internet at all, even in safe mode. I dont know how to get on there and it is getting frustrating. Basically I cant run anything. Once I try, it brings up those system alerts. How can I get Malawarebytes if I cant get to the internet to download it. Please please, if anyone can help, in the easiest way possible, explain to me how to do it. Thank you so much if you can help. Derek, what shows your browser when you trying to download Malwarebytes ? 2. try rename Malwarebytes installer to 123.com or 123.scr or iexplore.exe, then run it. yeah, seems to have worked – thx!